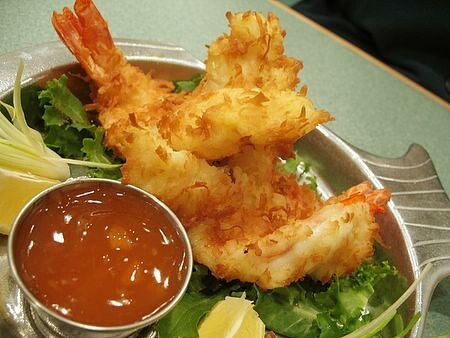 Although we have access to great sushi and Asian-style seafood restaurants, One of the problems we have in Northern New Jersey is that we have a lack of regular, traditional, American-style seafood places and seafood stores and fish mongers. 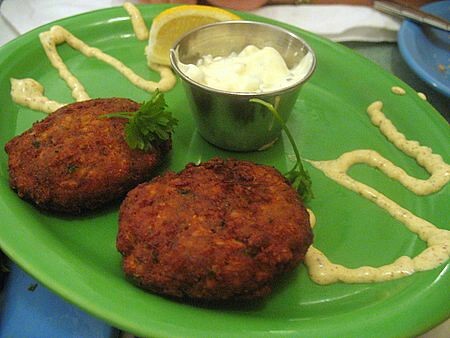 Sure, you can get a pretty good seafood meal at Legal in Garden State Plaza or in the nearby Palisades Center in New York, but for the most part the independent, small seafood restaurant serving fresh catch is extinct. 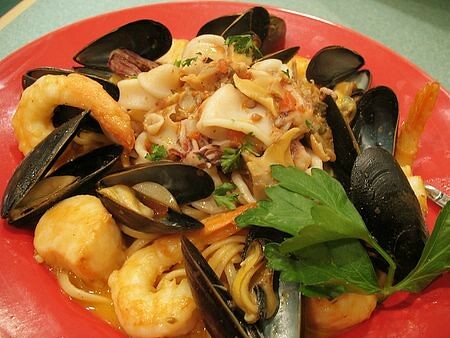 So when Seafood Gourmet opened up its little 25-seat dining room in January of 2006 serving traditional American (and Italian-American) seafood the restaurant became an instant hit. It’s not unusual for this place to do well over 100 covers a night, so you want to get there early. Seafood Gourmet storefront in Maywood. 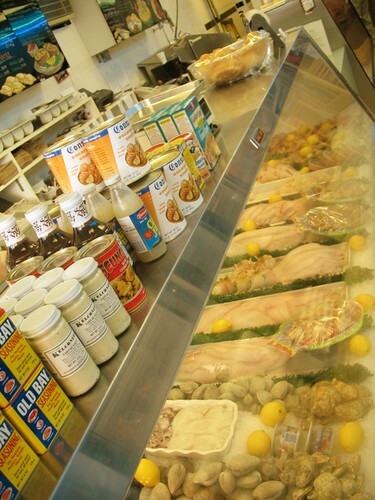 The counter where you can order fresh fish to take home. Ready for some serious seafood? Click on the “Read the rest of this entry” link below for more. 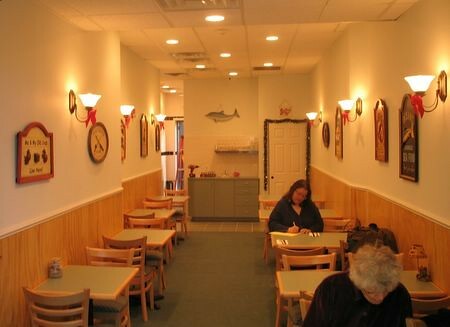 The dining room is small and cozy, and gets packed real quick. 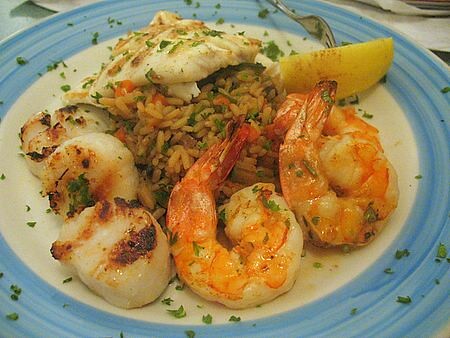 Halibut with Shrimp and Scallops over Fried Rice. 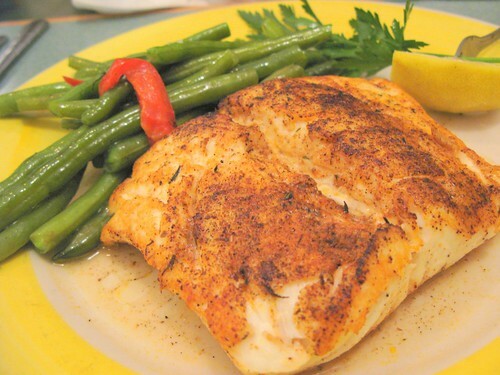 The fish at Seafood Gourmet is impeccably fresh. 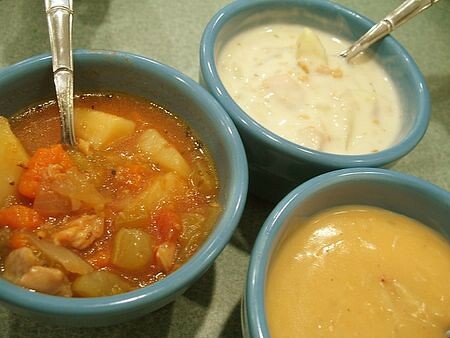 Three different soups are made each day — Manhattan and New England Clam Chowders and Lobster Bisque. 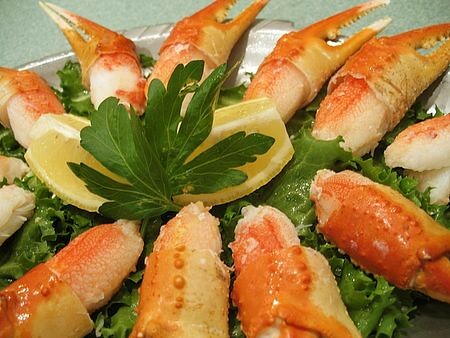 Get your Crab Claws here. 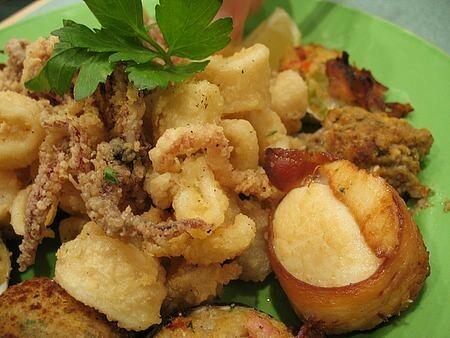 The mixed seafood hot antipasto is a killer, especially those bacon-wrapped diver scallops. 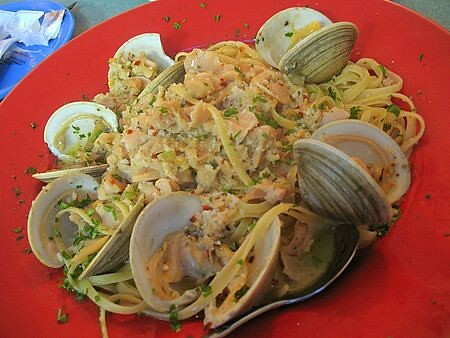 Seafood Gourmet makes a mean white clam sauce using both Little Necks and Cherrystones. 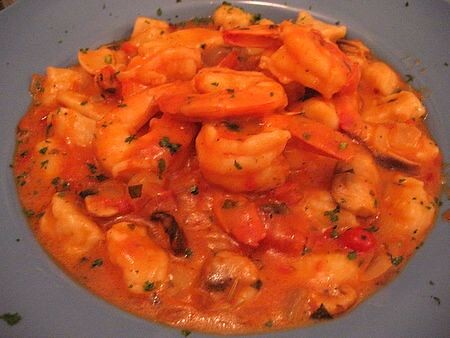 This entry was posted on Saturday, July 7th, 2007 at 10:00 pm and is filed under Food, General, New Jersey. You can follow any responses to this entry through the RSS 2.0 feed. You can leave a response, or trackback from your own site. 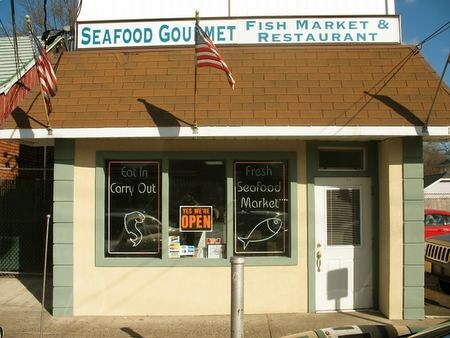 This place is the best seafood in all of northern NJ. Nobody compares and the owners, John and Diane are the greatest hosts you’ll ever meet. 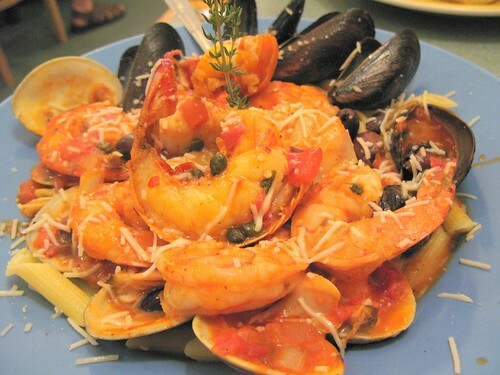 The seafood here can’t be beat. Period! 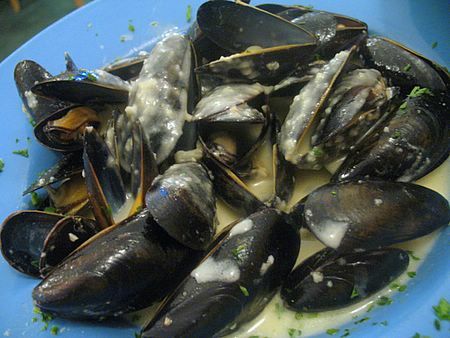 My wife and I wait until we get BACK from the Jersey shore to splurge on a seafood dinner. This place is that good. Maywood, NJ is a lucky town. 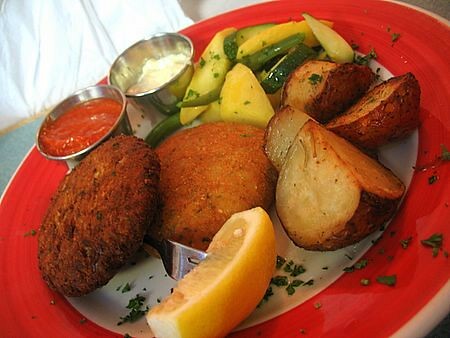 The freshest seafood and best tasting, in Bergen County we have had in years. Will deffinitely take the ride from central jersey and go back! It made you feel like you were right by the ocean. 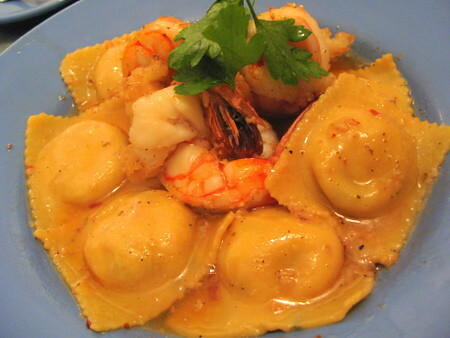 My friends and I go to the Seafood Gourmet pretty much every week and we absolutely love it! 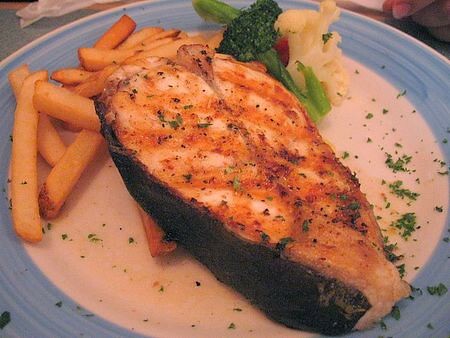 The fish is so fresh and the dishes are so unique. 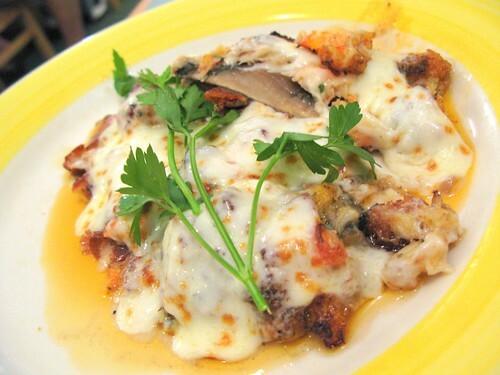 It is so nice to have a nearby place to enjoy friends and great food!! Also, Tom the waiter is always attentive to what we need and always has a cute smile that makes the day even better. Wow, this place has immediately earned a place on my must-dine list! 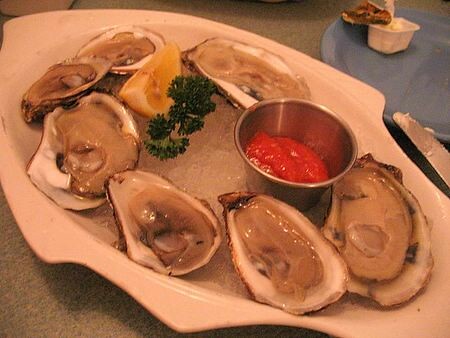 OMG Cherrystones AND Littlenecks……that looks like a true clam lover’s dream!!!! 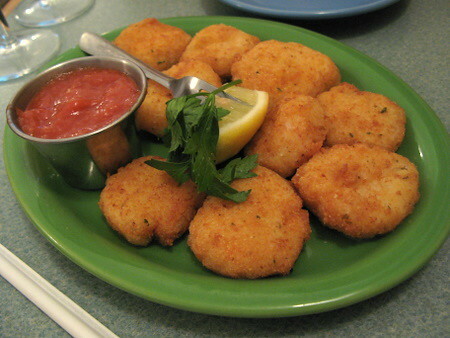 This is a quaint local seafood place with energetic young servers who try their best and are very friendly. the food is good to very good at times, but when the bill comes, do not be surprised if it is on the high side for the type of place it is. You can go to very nice restaurants with full service and full bar selections and come out just as well with the same quality food and the same bill at the end of the evening. Our bill for three adults ordering appetizers and entrees with a couple of bottles of Pellegrino including tax, but not gratuity was just over $125.00. The 1 and 1/4 pound lobster special for the night was $28.00 stuffed. I can go down to Ferry Street in Newark and get a 3 pounder for less than $24. Portion sizes here were just right and we did not leave feeling over stuffed. Where is this great sushi in Northern NJ you speak of? I’ve searched and come up empty, so I still go to NYC for that. Please, please don’t say East. SushiTen in Tenafly has really nice sushi. This place is clean, appetizing, great menu. 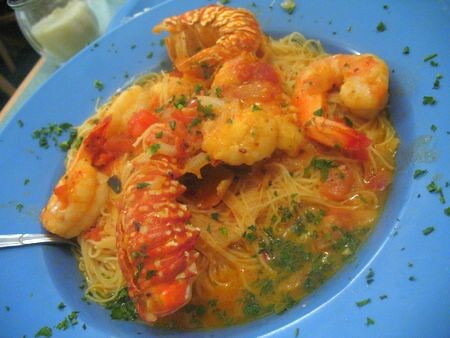 I ate the luncheon special, half of a lobster, two jumbo shrimp and mussels fra diablo over linguine…the price was reasonable, the food was delectable, not heavy, very tasty. I will be back, thanks John. this place is right around the corner from my house and I have eaten here many times. Aside from a restaurant, this place is a great fish market with really good quality fish. The new england clam chowder here is very good and I’ve yet to find an italaian place in the area that can top their fried calamari! discoverd this place on http://www.offthebroiler.com . my wife and i taker our dog to van saun park in paramus and always hit this place for some of the best seafood at the cheapest prices anywhere. this little hole in the wall has the best sandwiches. a huge scallop sandwich on a club roll with tomaoto,lettuce and tarter sauce is only $5.99! the fish wraps and the fish sandwiches are great. the bread is so fresh. the buffalo shrimp wrap is one of the best sandwiches ever. the home made lobster bisque and home made clam sauces are great. closed on mondays for years this place is now open on mondays due to popular demand. get there early becuase the place really gets packed quick. great place . nothing i found published hours of operation. Closed Mondays, I’m fairly sure, open until 9PM. 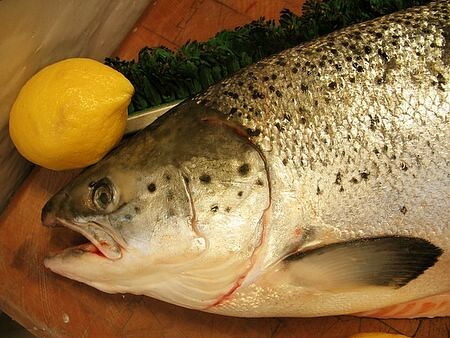 Looking forward to enjoying some fresh fish. 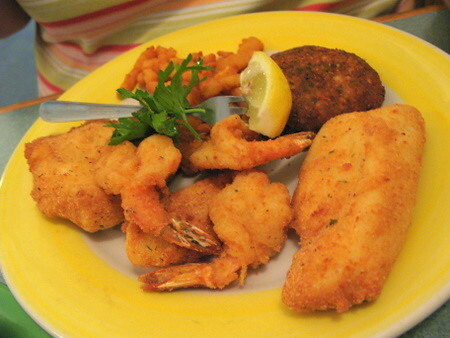 Seafood-gourmet.com NEW WE SITE! menu Reservations information!